Leatherman makes such a wide variety of multi tools that it can be difficult to decide which best fits your needs. Leathermans are divided up into several different broad categories based on the ruggedness of the tool: Keychain, Pocket-Sized, Full-Sized, and Heavy Duty. Full-sized Leatherman multi tools have an extremely broad range of uses for most situations you run into on a daily basis. Each full-sized multi tool is still centered on the characteristic Leatherman knife and pliers design, but they have different peripheral tools to accommodate users with different lifestyles and needs. What Makes a Good Multi Tool? The original purpose of a multi tool was to condense several stand-alone tools into one, compact, easy-to-carry package. The question is: Do they fulfill their purpose without making unacceptable compromises on tool quality and ease of use? To accomplish the most number of tasks, a good multi tool needs to focus on performing the basic tasks that we do every day. Each tool should be as general as possible with broad functions, but not so broad that it doesn’t work. Specialized multi tools can be different, but for now we’re focusing on daily-carry, general-use multi tools. 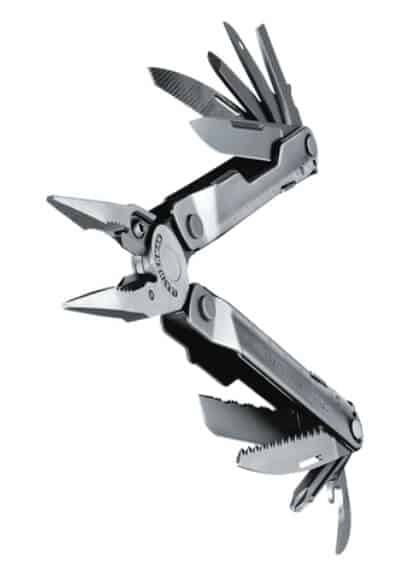 Leatherman’s most popular full-sized multi tool is the Leatherman Wave. Its all-around utility, high quality, and ease of use make it one of the best multi tools on the market today. If this is your first multi tool or you do not know exactly what you will be doing with it, then the Leatherman Wave is what you want. 1. Straight Blade: the straight blade is non-serrated, has a double-sided bevel, and locks open. 2. Serrated Blade: the serrated blade is good for cutting food with a skin. It has a single-sided bevel for evenly slicing food, a textured outer edge for easy distinction by touch, and it locks open. 3. Wood Saw: the wood saw is 3 inches (7.5 cm) long and is specifically for cutting wood not metal. It cannot be sharpened at home, and it locks open. 4. File: the file has both fine and coarse grain flat sides, and the thin edge is coarse for cutting through metal. It is made from hardened tool steel, not stainless, so it can rust. It is not detachable, so you cannot sharpen your Leatherman Wave’s knife blades with your Leatherman Wave’s file. The file locks open. 5. Pliers: the pliers come with thick and thin gauge wire cutters that are not spring loaded, so you will have to use two hands to open it. For spring-loaded pliers see the Leatherman Wingman and Leatherman Sidekick. The pliers do not lock open. 6. Large Screw Driver: the large screw driver is great for use with most normal size screws in appliances/life. For inset screws and bits that are not Philips or flat head, a bit extender and bit set can be purchased separately. Otherwise, it does NOT have much reach for screws that are inset. The bit is reversible for use with both Philips and flathead screws, and it does lock open. Note: The phillips head is slightly flattened to fit in the handle. Because of this it doesn’t fit screws quite as well as a normal phillips bit or screw driver. It gets the job done, but it does compromise a little to keep everything compact. 7. Small Screw Driver: the small screw driver is great for screws in phones, glasses, and small electronics and has a longer reach for inset screws. The bit is reversible for use with both Philips and flathead screws, and it does lock open. 8. Scissors: the scissors are spring-loaded for one-handed use. They work well for string, paper, fishing line, and okay for light cloth, but they are too small for heavy use. The scissors lock open. Note: The scissors are one of the weaker tools on the Wave. For better scissors, see the Leatherman Wingman. 9. Pry Bar: the pry bar prevents you from breaking your flathead screwdriver opening a paint can. It has sharp, as opposed to rounded, edges for dgging/scraping, and it locks open. 10. Can Opener/Bottle Opener/Wire Stripper: the can/bottle opener is pretty standard and works as advertised. At the base of the can opener is a wire stripper that is easy to miss if you do not know it is there. It does lock open. 11. Ruler: the ruler has both centimeters and inches. For accurate measurements push both sides of the ruler together (pliers = closed). The zero point is all the way at the end of the handle, and the total length from tip to tip is 8 inches (20.3 cm). If you don’t have a precise idea of what you need in a multi tool, the Leatherman Wave is what you are looking for. While cheaper and more specialized options are available, the Wave is the best all-around tool for most people. It has a great selection of common tools and none of the odd-looking ones that you never use. Since the Wave has a comprehensive toolset, it can help you learn which tools you use the most and which tools you do not need, so that your next multi tool will be exactly the right fit. Although the Leatherman Wave is described as built for one-handed use, you will need two hands to open every tool except the straight knife and the serrated knife. The scissors can be operated with one hand but not opened. The Wave is uncomfortable to carry in a pocket without the pocket clip. The scissors are okay but not great. Although I have been using the Wave for years and recommend both the tool and the company to everyone who asks, it does lack a few tools that many users might want. 1. Cork Screw: without a corkscrew a bottle of wine is pretty tough to open. The Leatherman Juice is a small multi tool that includes a corkscrew. ​2. Removable File: a removable file on the Leatherman Wave would let you sharpen the knife blades or remove burs etc. Some other models like the Leatherman Surge do have this feature. 3. Leather Punch/Awl: the leather punch/awl is included on the Leatherman Rebar. 4. Tweezers: the pliers can take out large slivers, but tweezers do a much better job. 5. Spring-Loaded Pliers: the pliers can be awkward to operate with one hand. The Leatherman Wingman and Sidekick both offer spring-loaded pliers. 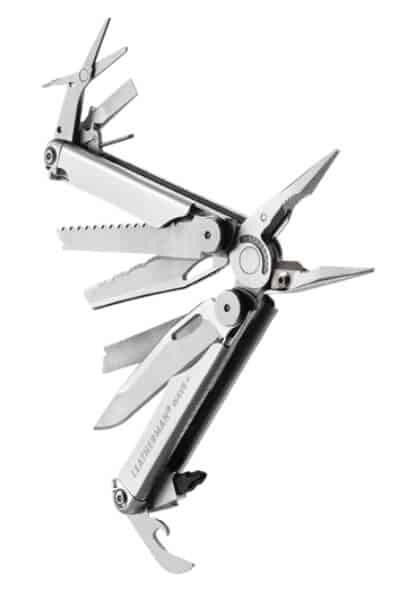 For a smaller, light-weight cousin of the Leatherman Wave, check out the Leatherman Sidekick. For a larger, more durable version check out the Leatherman Surge. The Leatherman Rebar is an outdoor, working-man’s tool designed for heavy use of the pliers, wire cutters, and screw driver. It is thinner and less expensive than the Wave or Charge, but it still features full-sized tools that do not feel like a compromise. All of the secondary tools fold out from the inside because the pliers are emphasized as the main tool that will be used the most. 1. Pliers: the pliers have needlenose and regular. They are not spring-loaded and do not lock. 2. Replaceable Wire Cutters: the replaceable wire cutters are very well aligned so they can almost cut like scissors. When they are dull they can be replaced, but you'll need a specialty bit to do it. 3. Straight Blade: the straight blade is 2.9 in (7.36 cm) and made of 420 High Carbon steel. The edge has a double-sided bevel, and it locks open. 4. Serrated Blade: the serrated blade is 2.9 in (7.36 cm) and made of 420 High Carbon steel. The edge has a single-sided bevel, and it locks open. 5. Wood Saw: the wood saw is full-length at 2.9 in (7.36 cm). It cannot be sharpened at home (without special tools), and it locks open. 6. File: the file only has coarse grit for wood and metal filing. It does not have the diamond-coated fine-grit file. It does lock open. 7. Electrical Crimper: the electrical crimper is exactly the same design as exists on the Leatherman Wave, but it is not listed as a tool on the Wave. This makes me think that it is just a pinch point that they later realized was useful for crimping. 8. Flathead Screwdriver: the flathead screwdriver comes in both large and small. The large is sturdy enough to be used as a pry bar. 9. Phillips Screwdriver: the Philips screwdriver does not have an interchangeable bit. It is long and thin enough to fit in some tight places, and it does lock open. 10. Bottle Opener/Wire Stripper: the bottle/can opener is pretty standard. The wire stripper is the V at the base of the bottle opener. It locks open. 11. Leather Punch/Awl: the awl does lock open. 12. Ruler: the ruler is 8 in (20.32 cm) from tip to tip. Make sure the pliers are closed when using the ruler’s full length. On the Leatherman Rebar, pliers and wire cutters come first, but it also sacrifices a larger variety in favor of more full length tools that do not make compromises. The Rebar is designed to be a light, daily-carry multi tool for those who don’t want to compromise quality for quantity. The Leatherman Rebar unfolds from the inside, making it inconvenient if you mainly use the knives. Two hands are required to be able to use the Rebar. Leatherman does not make a smaller, lighter version of the Leatherman Rebar. For a larger, heavy duty version, check out the Leatherman Super Tool 300. For worksites that do not allow knives, check out the Leatherman Knifeless Rebar. The Leatherman Wingman is an urban multi tool that features the best scissors in its size class, spring-action pliers, and a package opener. It is designed for light-duty work around the house when you do not need a bulkier set of tools. The scissors are extremely good considering the size of the tool. The spring-action pliers make one-handed use easy. A specialized package opener makes opening obnoxiously-wrapped plastic packaging easy. 1. Scissors: the scissors open from the outside when the tool is closed, and they are spring-loaded for one-handed use. They are large for a multi tool but still not as good as full sized scissors. They lock open. 2. Knife: the wingman only has one knife that is a combo straight and serrated blade. It does lock open. 3. Pliers: the pliers have both needlenose and regular, and they do not lock. 4. Wire Cutters: the wire cutters are pinch-type cutters, as opposed to shear-type, and are only good for small wires. 6. Package Opener: the package opener easily opens difficult plastic packaging without damaging the contents or your fingers. They do not lock open. 7. File/Small Screwdriver: the file and small, flathead screwdriver is a half-length wood and metal file with a flat-tipped end that works as a small screwdriver. There is no diamond-coated, fine-grit file. The file is non-locking. 8. Can Opener/Wire Stripper: the wire stripper is the V at the base of the can opener. It is non-locking. The Leatherman Wingman is supposed to be a small, light, pocket-carry multi tool, but the weight is slightly heavier than the Leatherman Rebar with fewer tools. The half-length file is difficult to use effectively due to its size. The wire cutters are only useful for small wires since they pinch instead of shear the metal. For a smaller, lighter version of the Leatherman Wingman, check out the Leatherman Rev. For a larger, heavy duty multi tool with more functions, check out the Leatherman Wave. The Leatherman Sidekick is similar in size and number of functions to the Leatherman Wingman, but it has different specialties and accepts different shortcomings. It is designed to be mainly for cutting and sawing with light-duty pliers and screwdrivers. The Sidekick is a good outdoor, light-duty pocket carry multi tool. The full-length wood saw makes a solid addition to camping tools. With a full-length straight blade, a full-length wood saw, and a half-length serrated blade, the Leatherman Sidekick is specialized for cutting. 1. Wood Saw: the wood saw opens from the outside. It is full-length and locks open. 2. Straight Blade: the straight blade is full-length with a double-beveled edge. It locks open. 3. Pliers: the pliers are both needlenose and regular, and they do not lock open. 4. Wire Cutters: the wire cutters are pinch-type as opposed to shear-type cutters, so they mostly work well for small wires. 5. Phillips and Flathead Screwdrivers: the screwdrivers are non-locking. 6. Half-Length Serrated Blade: the half-length serrated blade opens from the inside and has a single-beveled edge. It is non-locking. 7. File/Small Screwdriver: the file/small screwdriver is half-length for metal and wood. There is no diamond-coated, fine-grit file. The tip of the file is a flathead screwdriver. It does not lock. 8. Can Opener/Wire Stripper: the wire stripper is at the base of the can opener. It does not lock open. The Leatherman Sidekick has a similar downside to the Wingman in that it has fewer tools than the Leatherman Rebar while still having a similar weight. The half-length wood and metal file is too small to do much real work. The Sidekick does not have overlapping, shear wire cutters, so it can only be used on small wires. There is no smaller, lighter version of the Leatherman Sidekick. For smaller Leatherman multi tools, check out pocket-sized tools like the Leatherman Skeletool CX or the Leatherman Squirt. The Leatherman Wave is an excellent all-around multi tool with most tools the average person will need. It is heavier than some of the other full-sized multi tools and needs a pocket clip or belt holster to be comfortable. The Leatherman Rebar focuses on an excellent pair of pliers with full length tools that do not compromise quality for quantity. All of the tools unfold from the inside making it inconvenient if the knife is used most frequently. The Leatherman Wingman is a light-duty, urban multi tool with a great pair of scissors and a specialized package opener. While it is great for light-duty work around the house, heavier work will be difficult. The Leatherman Sidekick is similar to the Wingman in scope, but it has better knives and a full-length saw at the expense of scissors and the package opener. It is good for light-duty work outdoors when camping or hiking. When you are the first responder to a scene, you never know what situation you will be in. Although full-sized Leatherman multi tools like the Wave, Rebar, Wingman, and Sidekick are not specialized for first responders, their tools cover an incredibly broad range of circumstances. During my time as an EMT, I used my Leatherman Wave all the time to do everything from cutting bandages to taking a door off its hinges during a bariatric extraction. Leatherman does make two specialized, first-responder multi tools for extractions and trauma. The Leatherman Raptor is a heavy duty pair of trauma shears that also comes with several tools for extractions and burn victims. The Leatherman Z Rex is a light-weight, reversible strap cutter.